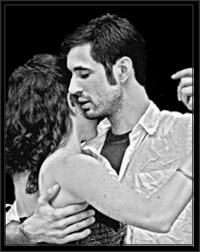 Joseph Leonardo is a highly regarded teacher and DJ of Argentine Tango from Portland, Oregon. Since 2004, Joseph has taught workshops, group classes, and private lessons, participated in national tango festivals and DJed throughout the United States (SF Antipanico, Tango Element, Seattle Tango Magic, Denver Memorial Day Festival, Portland Tangofest) and was one of the most active and devoted members of the Portland Tango community, hosting the popular “aime comme moi” Milonga, Bamboo Grove Practica, and Milonga Pa' La Gente. He is an excellent DJ whose knowledge and love of the music consistently translates into amazing nights of dancing. Joseph is also the creator and head of TANGO SILENT FILMS, a Portland-based film project involving the local tango community in creating joyous and hilarious films based on our tango culture and music. Joseph Leonardo began dancing Argentine Tango in 2003 in the local milongas in Portland OR and his natural talent quickly led him to devote a large part of his life to the dance. In late 2003, he began attending tango classes at Portland State University where he played an integral part in the formation of the university’s student Tango Club. From January 2006 to June 2009, he was the instructor and guide for the club, teaching at the club's Tuesday practica. He has studied mainly with Alex Krebs (Portland OR) and Jaimes Friedgen (Seattle WA) and from June to October 2006 lived in Buenos Aires where he studied and danced Argentine tango extensively. Joseph was based out of Tango Berretín, the well-known tango studio of Alex Krebs, where he has also worked as a general studio manager from 2006 until 2014. Joseph has recently relocated to Ann Arbor MI to focus on writing and filmmaking.